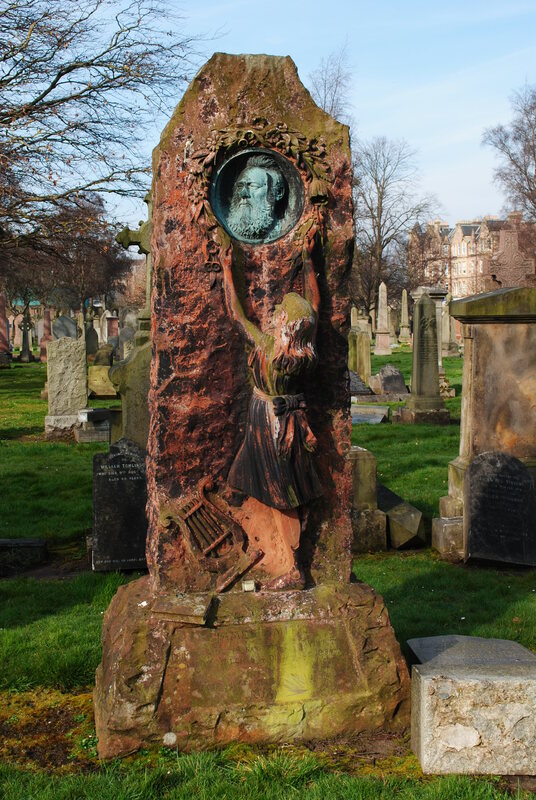 James Smith was a printer and Scottish storyteller. His poems and stories were published in local ne wspapers. A collection of his poems was published by Blackwood in 1869. Stories, dialogues and poems were in the vernacular with some examples, such as “Habbie and Madge” and “The merry bridal o’ Firthmains”, to be found on the Internet. Born in Edinburgh on 2 March 1824, James worked as a printer in England and Ireland before returning to Edinburgh. He worked at the office of Aikman, a law printer, where he became manager. Subsequently, he became librarian of the Edinburgh Mechanics Library; and was an enthusiastic freemason. He married three times, and had seven children. He died on 12 December 1887. His elaborate monument was “erected by friends and admirers” two years later. 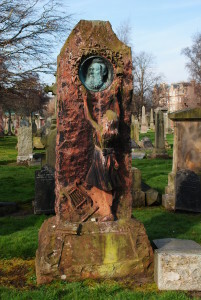 It depicts a portrait of James Smith by the sculptor Charles McBride, with a female figure holding up a wreath.